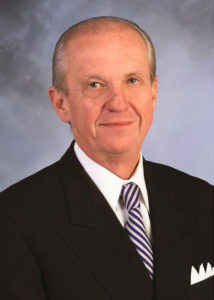 A.D. “Pete” Correll is a native of Brunswick, Georgia and served as CEO of Georgia-Pacific for 13 years. He is Chairman of the Board of Grady Memorial Hospital Corporation and serves on the boards of the Georgia Aquarium and the Mother Nature Network. He holds a Bachelor’s degree in Business Administration from the University of Georgia and Master’s degrees in Pulp and Paper Technology and Chemical Engineering from the University of Maine, as well as an honorary Doctor of Humane Letters from the University of Georgia and an honorary Doctorate of Public Service from College of Coastal Georgia. Among his many notable acts of service, when Correll learned that Ebenezer Baptist Church had stopped its renovation project for lack of funds, he called the church where Dr. Martin Luther King, Jr. preached and told them to re-start the construction. He’d get the money, he told them. “We got ten companies to give $100,000 each, and we did it in one afternoon,” Correll says.